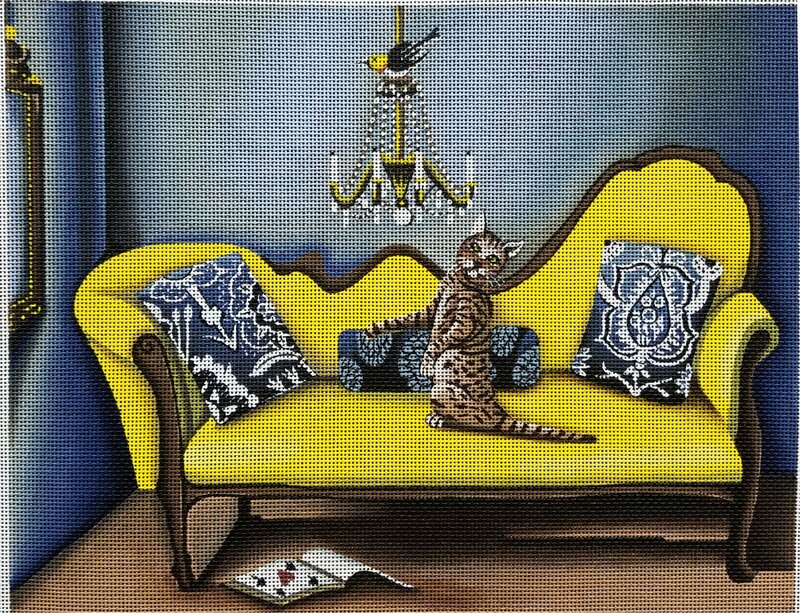 A whimsical still life handpainted needlepoint design called Return of the Finch by the artist Catherine Nolin. The finch on the chandelier is kept a watchful eye on by the cat on the bright yellow couch. The gorgeous colors make this a simply striking design. The needlepoint design area measures 14" x 11" and is hand painted onto 13 mesh mono canvas. Comes with or without fibers - make your choice from the drop-down menu. If you select cotton we will send DMC cotton floss. For wool and silk we use Planet Earth boutique fibers which are single-ply for 13 mesh and easy to stitch with. If you require stretcher bars to make a frame to hold your canvas then we recommend a pair of 18" and a pair of 15" and some thumb tacks.